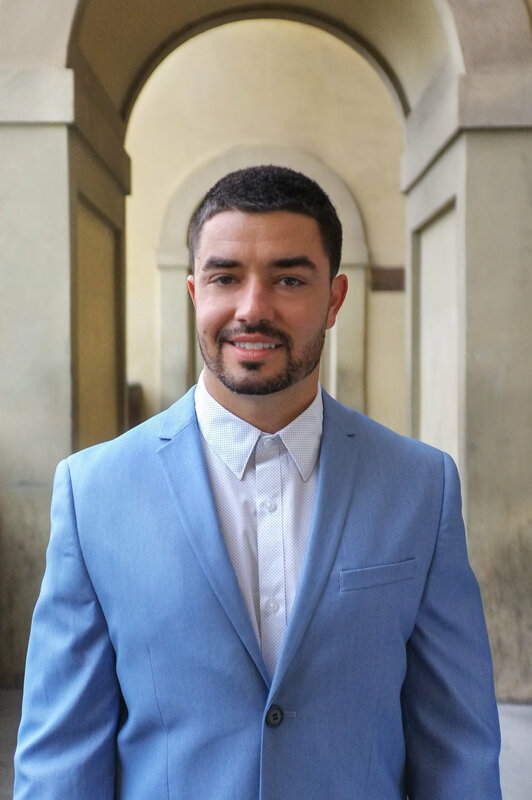 I was planning a trip to Florence, Italy (or Firenze, in Italian) and am a part of a travel group and came across Maria, she was eloping in Florence the same time I was going to be there and our dates lined up perfect! Maria and her fiance, Ryan, are from Florida and wanted a small elopement with just a few friends. They had a small civil ceremony later that night with friends and we got pictures before I was scheduled to leave in the morning - it really worked out perfect. They packed light & picked up a bouquet from a local florist who shares the space with a restaurant & shop, where Maria & Ryan later had their intimate Italian dinner reception. We wanted to make sure to get all the sights of Florence, so we planned romantic photos all over the beautifully art & architecture filled city. 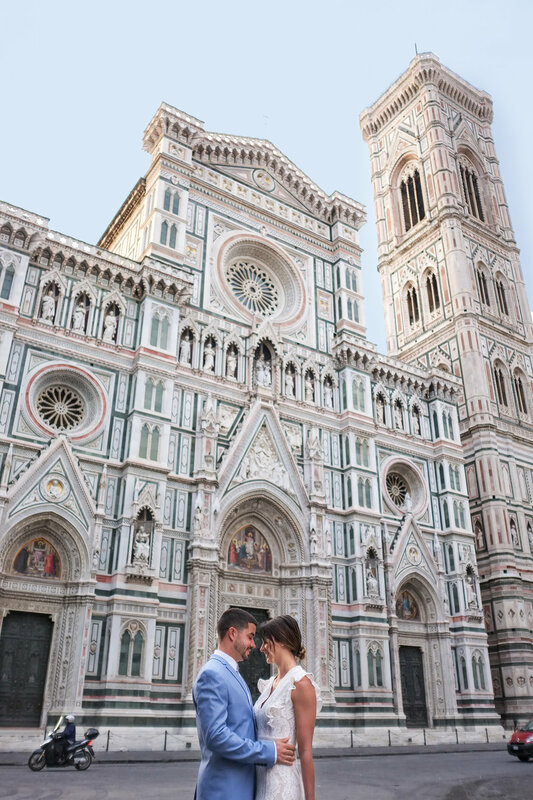 I can see why Maria & Ryan chose Florence, it's truly a great destination for a wedding! 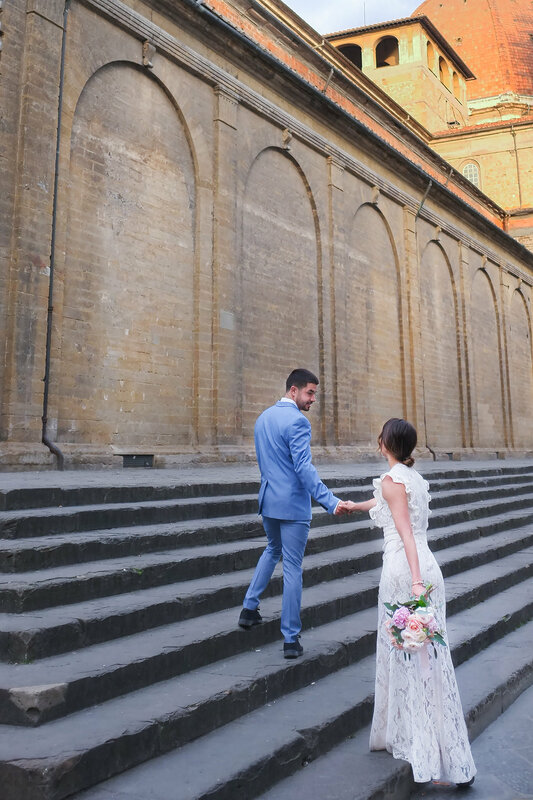 Let's check out their Italian Elopement Wedding in Florence, Italy! Maria's bouquet was full of peonys, ranunculus & eucalyptus, her flowers were from Artemisia and the restaurant they had their private dinner at was La Ménagère, a modern italian locally sourced resturant. Both Maria & Ryan were concerned about packing lightly but still bringing their wedding attire, they chose clothing that was either wrinkle-free or easy-iron. Maria wanted floral & feminine, she went with BHLDN dress from Anthropologie. Ryan wanted a pop of spring color & found the perfect suit from H&M that went great his comfy All Birds tennis shoes. Maria & Ryan wanted to get all the best Florence historical & architectural spots for their romantic photos, we decided the Ponte Vecchio bridge, Il Duomo di Firenze and Piazzale de Michaelangelo were the right expression of both their love & their love for Florence! We love weddings all over the world, if your wedding is a magical destination, let us know & we can discuss adding to your wedding package!